It’s September! And with that, the initial shock of THERE IS SO MUCH TO DO AND THE CHILDREN ARE COMING has ended. 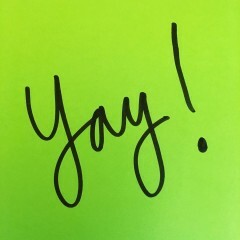 Since we are no longer in panic mode, it seems fitting to discuss how we are going to accomplish tasks on our to do lists in the most time saving, efficient, productive, helpful, organized, and prettiest fashion. 🙂 I have finally landed on a system that works for me, and it might work for you too. I like to casually refer to it as my teacher planner alternative. If my system is archaic and not up to snuff, Noelle is going to share her very cool system later this month. Oh, flexi, where were you my first year teaching!? I didn’t get introduced to the beauty of the flexi until my third year teaching. Years 1 and 2 were spent triaging my to do lists and plate spinning all of the schedules and documents I had to keep up with. Flexi, you solved all of those problems for a mere $10. I was introduced to this system by Maia Heyck-Merlin who lead a professional development, The Together Teacher, at a conference I attended. 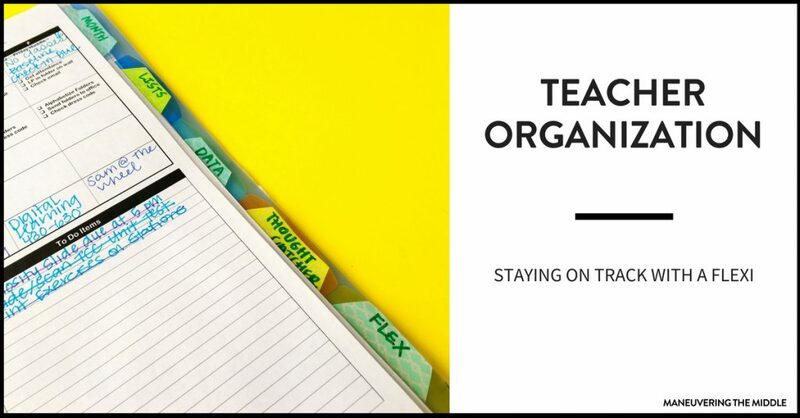 You should check out her website for more amazing organization tips or grab her book, The Together Teacher, where you can read more about her organizational ideas! 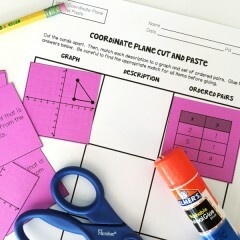 Anyway, the flexi is a planner that you can customize, hence teacher planner alternative. It is similar to an Arc, but the cost is substantially less. In the training, book, and course Maia shares great examples and templates that you can edit to suit your needs, and spends a chapter on each of the sections of the flexi. 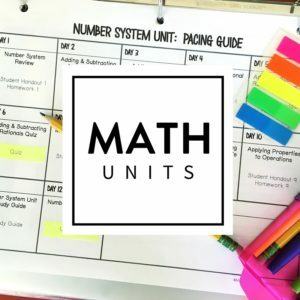 I used her structure to make a worksheet that fits my schedule, but she offers a free download here that might be a great starting point. 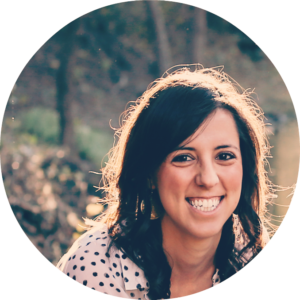 It was so helpful to see her break down her organizational systems because she was a teacher and really knows what we need. Who else can better relate to all the parent phone calls, copies, lessons, meetings, paperwork? 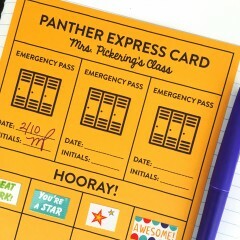 I customize it each year because I CAN, and because my schedule and responsibilities change each year. The top half of the worksheet is a glance of my week. The top row is dedicated to reminders for that day. If I get an email with a reminder that we have a Fire Drill on Thursday, I would write it in at the top, so it doesn’t get lost among the other to dos. Below that, I have a section with reminders of items that I need to accomplish before students arrive. 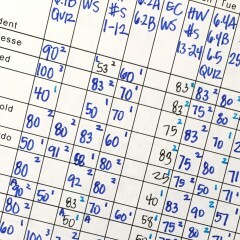 These will never change, so they go into the computer version of the worksheet. I have to check my email each morning, so there is no point in writing that in daily, but I need to check off that I did it. If you have a homeroom or advisory where you have 90 tasks that have to be accomplished, put it in your calendar section too. Students office folders go home Wednesday and dress code has to be checked daily, so it goes there for the year. 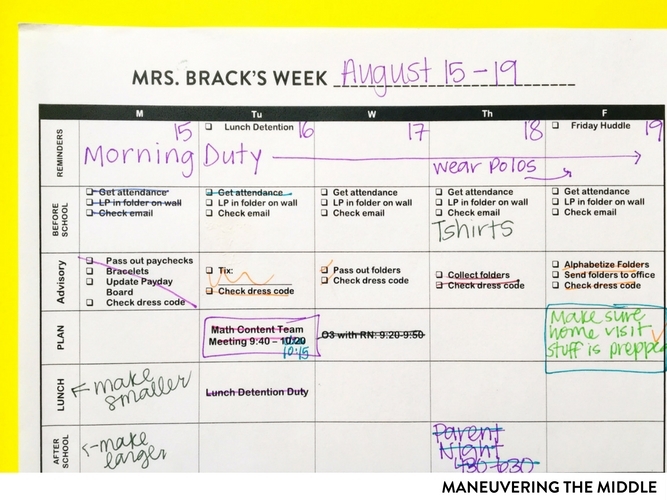 The weekly worksheet is great because it only focuses on the week at hand, which is a simplified alternative to a teacher planner. Then, my calendar space gets more flexible. I have a section to place any meetings or commitments that occur on specific days during specific conference/planning times. I have a category for lunch too because I have lunch detention duty on Tuesdays. Because meetings sometimes gets scheduled after school, I have a section for that too. I don’t have bus duty every week, so it is not typed in, but I write it in once a month when I have that duty. On Monday mornings, I look at my Outlook calendar to check to see if I have any ARD meetings or any other commitments during my planning period or after school, and then I write those in for the week. If it is a regular occurring event, I type it it. 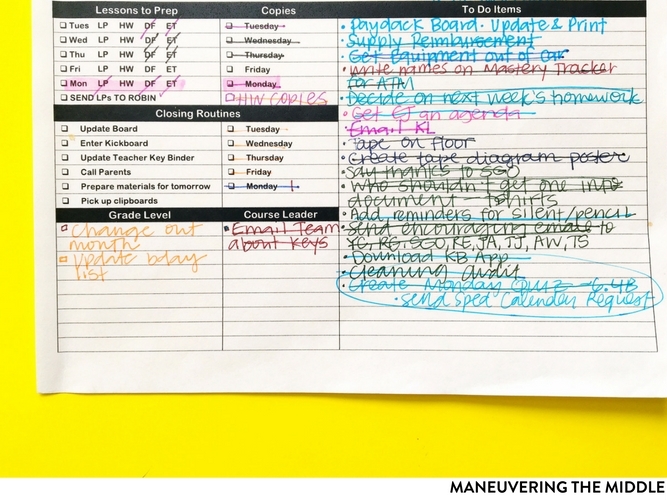 Anything handwritten applies only to that specific week. Since preparing lessons and making copies will always be items on my to do lists, it seems bizarre to write them in each day. And for two years, I wrote this as a todo every. single. day. Instead, I can now just check off when I have accomplished it. These are the responsibilities that I have committed to completing before I leave school for the day. These are tasks that make the next day much easier. All of these tasks ensure that if I were to get stuck in traffic or arrive exactly when my students do, I would be prepared for that day. I never leave work knowing that I still have to prepare the next morning for that day’s lesson. I say this now. I didn’t say this year 1, 2, or 3. I have taken on some more responsibilities this year that don’t necessarily require an action step daily, but are commitments nonetheless. I have this on my weekly worksheet, so I don’t forget that I need to be doing them. For example, I have a big deadline 3 weeks from now for my role as course leader. This area allows me that I need to be making small strides toward that larger task. 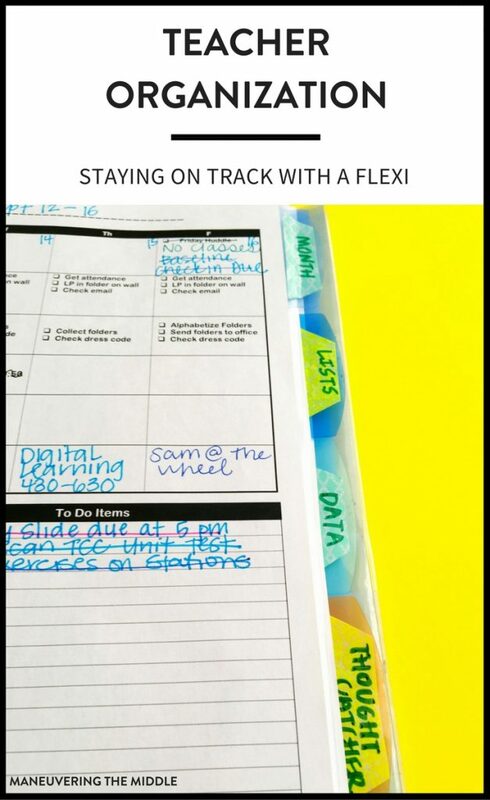 I have seen people use a small section on their weekly worksheet for personal reminders too. Remember, this can be personalized! There is no task too small to place in this section. I write anything down that I think to do. After 3 weeks, I have yet to need more space. I write down any people I need to follow up with, parents I need to call, supplies I need to request, items I need to remember to bring home, teachers I need to observe, students I need to write notes to. Anything that can be accomplished during that week goes on the list. And anything that doesn’t get accomplished gets added to the next week’s list until it is done. This is my second most referenced section of my flexi, so it is under the second tab. I refer to it often in meetings when a date is brought up that is further out and I need to record, but do not necessarily need to do anything else. I record birthdays, deadlines, no school days, end of the grading period dates, and field trips here. This section is a mish-mash of lists. For example, I made a list of students who still owe me homework last week. 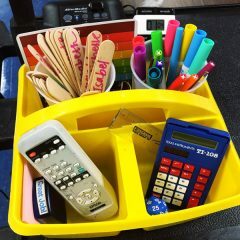 When I was setting up my classroom, this is where I kept a list of all the items that needed to get done. Since setting up my classroom spanned several weeks (it is still ongoing), I used this section for recording. Sometimes, I use this space to work out a math problem. I meet with my grade level every week, and my AP every other week. If there is something that comes to mind in the off time that I need to bring up at either of these two meetings, I record them on this page. That way I don’t get stuck saying, “there was something I wanted to talk to you about, but I can’t remember.” This is also where I record meeting notes (though I rarely do.) Confession: I have only been doing this for a few weeks. The jury is still out of its necessity for me. This section has changed depending on the time of the school year or what project I am in the middle of. I used to keep a list of all of our state standards on hand, but then I didn’t reference it very often. I am still trying to decide on a useful system for this tab. Right now, I usually stick meeting agendas in this section until I can record any action steps and then I recycle the meeting agendas. 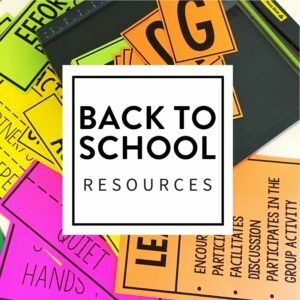 I have also put any one pagers that are helpful at the beginning of the year – staff directories, classroom assignments, student locker combos. The flexi is awesome! I print out a bunch of weekly worksheets at the beginning of the year, so that I don’t have to worry about running out or reprinting. It is perfect because it isn’t big and bulky, its easy to slip into a bag or take to a meeting, its inexpensive, and a catch all. 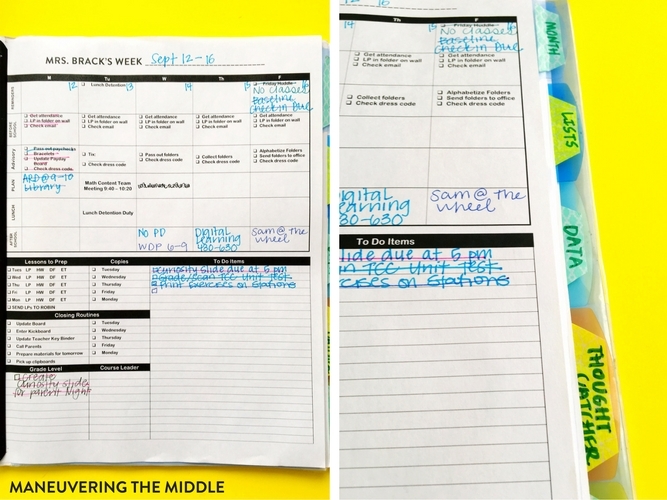 The perfect teacher planner alternative. 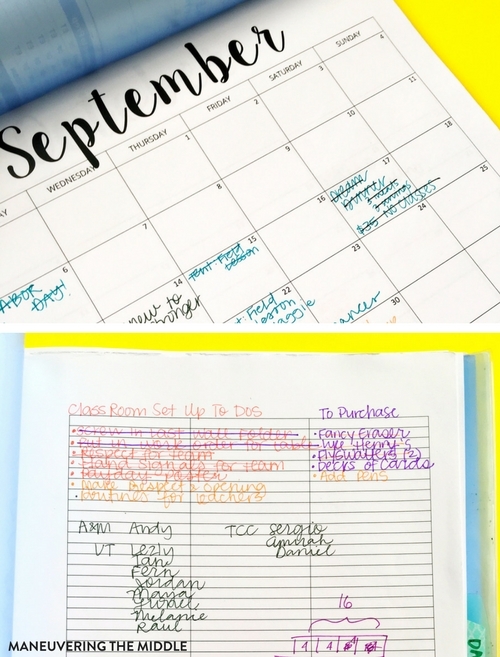 What system do you use to stay on top of your to do list? Check back later to see what Noelle uses! Hey! These are such great tools. Do you have the templates for your flexi you used available at your store ? I love your weekly worksheet. 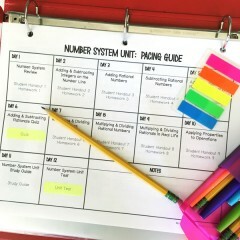 I was looking at the tracker that you have for lessons to prep. I’m wondering what each of the items means. I presume LP means lesson plan and HW means homework. What about DF and ET? I love this! I love that it’s flexible for when I change my mind on formats and items needed. I do have one question though. Why does your checklist start on Tuesday? It’s driving me crazy. Thanks! Planning is reserved for Monday’s, so that is why. 🙂 You can see more about that in the Teacher Work Life Balance post. I found this through another post (Work Life Balance) and I am super psyched to implement it when I begin teaching. 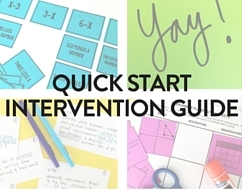 I always have something similar when I’m involved in play production and this guide with be very helpful when I need a teaching version. 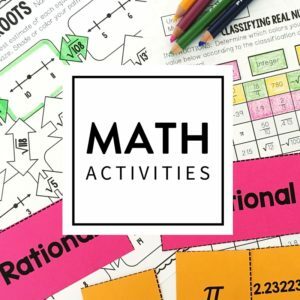 Despite going into high school mathematics, I’ve found that many of your tips and advice cross grades and are applicable to my needs. Thank you! Thank you, Brenna! Glad you got an idea that you can take and apply. I know you linked the free resources from The Together Teacher, but not all of them are editable. What software did you use to create your adapted ones? Truthfully, I created this one from scratch. I will email it you now. 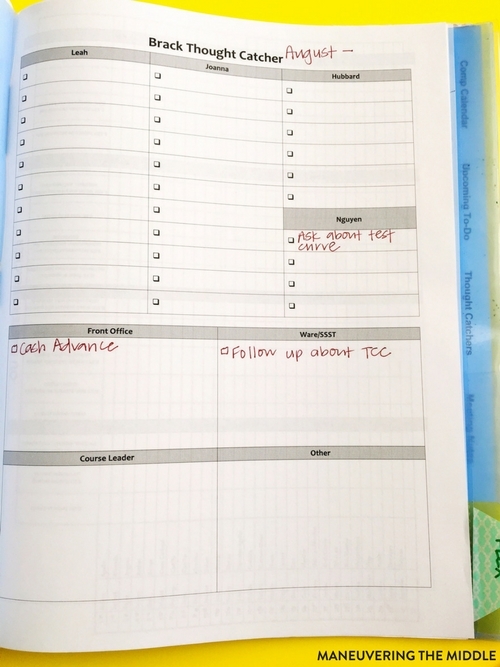 This is awesome, I love how you have so many checklists that are pre-done it makes it super quick and simple. I am definitely going to try to replicate this idea. 🙂 I have one question though, how do you get the pre-printed sheets into the Flexi?